Pitfall! for iOS, brought to you by The Blast Furnace and Activision on the game’s 30th anniversary, is a reboot of the series. Pitfall! for iOS, brought to you by The Blast Furnace and Activision on the game’s 30th anniversary, is a reboot of the series. Some of you may remember walking (slowly) across a pixellated screen, jumping over pits and swamps and crocodiles on your Atari. This re-imagining is not that game. 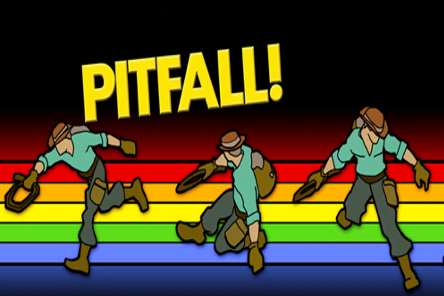 This version of Pitfall! can be considered a 2D/3D running game (which seems to be the name of an emerging genre on iOS) much like Robot Unicorn Attack and Nimp Rider. In these games you run and avoid obstacles and collect something, whether it be magical stars, rings, or, in the case of Pitfall!, silver bars. Pitfall! utilizes its name recognition (at least with old-school gamers) and reinvents itself through this new genre in an interesting, but ultimately frustrating, fashion. The game begins with a long loading screen. These lag and loading issues plague the entirety of the game, but we’ll get to that in a moment. The loading screen itself and the opening cinematic are awesome for fans of the old games. I won’t ruin it here but it definitely played with my nostalgia and made me smile. Then the game itself begins. The tutorial (found in the settings) explains how you swipe upwards to jump, downwards to slide, tap to attack, and tilt to strafe from one side of the track to the other. If you fail at the tutorial, it assumes you know enough about the controls (even if you fail at the first jump) and throws you into the game. This is a disheartening choice by the developers because, after failing my first attack due to lag, I was thrown into the main game without knowing some of the controls. Therefore, when a turn arrived, I smashed into the wall and failed simply because I didn’t know how to turn (which, in hindsight, seems self-explanatory: you swipe in the direction you want to turn). The controls themselves are easy to learn and work well. You’ll be hopping across gaps, sliding under logs, and attacking snakes with ease. The game changes from 2D to 3D arbitrarily which may seem annoying but actually leads to a variation that brings the game from verging on boring since it changes your experience of the one track. Since you’re running on the same track over and over again, people could memorize and beat it easily if this change didn’t occur. The added dimensional shifts brings more difficulty and diversity to the one track. The problem with the dimensional shift is, in 3D, the camera is right behind “Harry” so it’s hard to see and gauge depth. So, you may think a pile of rocks is farther than it is and jump too late and revert back to the starting point. This altering of the dimensions often develops lag as well. I experienced this lag every few times the dimensions changed. This forced me to fail early on in the track which dashes any hopes for me to reach the goal or even the first checkpoint. Speaking of checkpoints, you need to buy them in an online store. Activision was nice enough to give you some credit to purchase items just for buying the game but the rest either costs real money or a lot of silver bars (which you collect throughout the game). These checkpoints are pivotal and makes me think that they were purposefully taken out of the game in order to prolong its life. It’s hard, especially with the lag, to finish the course in one run with no checkpoints and to goad more money out of people’s pockets. The store also holds things such as coins to use to get the one checkpoint given to the player, extra lives, upgrades for you to hold more lives, and different outfits. Overall, unless you’re amazing at running games, you’ll need a lot of this stuff to beat the game. The graphics in Pitfall! are adequate. They serve the purpose. The environments vary as you progress through the course but not often enough. You’ll jump over the same rock formations countless times. The enemies also blend in with the ground and have nothing that separates them from anything else in the game so recognizing them is challenging and can lead in death. The sounds are generic. Light music plays as you hop along the course and the opening cinematic has some funny sounds and seems like the only place where real effort was brought in this department. Overall, Pitfall! is a running game that could have become another addictive entry into the growing genre. Instead, the lag at pivotal moments in the gameplay and the fact that Activision expects payment for integral aspects of any other game (such as checkpoints) ruins the experience. Maybe in another 30 years there will be a better Pitfall! iteration, but not this time. Josh lives just outside Boston. He fell in love with video games when his parents bought him Mario Bros for Nintendo and he's been gaming ever since. In his online dating profiles, long walks on the beach are never mentioned. Instead, he lists the desolate rubble of the Capitol Wasteland as his ideal vacation spot.